​Mandi is a busy mama of three and finally got the chance to pursue her dream in Hair at Vancouver Hairdressing Academy in 2015. Creating gorgeous colours and cuts for your lifestyle! Her bubbly personality and passion for hair comes out in her work! After graduating Mandi has never stopped educating herself, along with being a Davines Ambassador, she has completed two Balayage workshops, Master the Art of Balayage by Wella and Balayage and Freehand painting by Joico. She also attended a three day IQ Cutting method course by KMS in 2016. Recently she had the opportunity to attend a Bridal updo workshop with Stephanie Brinkerhoff! You can find Mandi working out of her own hair studio in Gibsons BC or Freelancing Weddings & Photoshoots! ​"A dream to work with. Super easy going, but very professional. Has the modern-messy-chique styling down to an art. 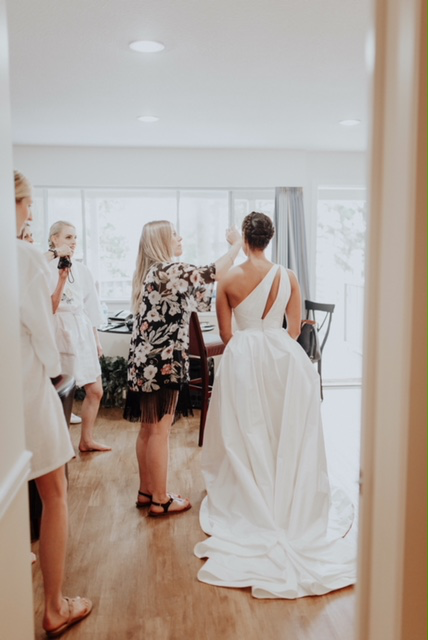 Thank you so much"
​"We chose Mandi to do our bridal party hair and we're so glad we did! She was great with our group, especially the flower girls, and we all loved the final results. Very professional and friendly, and I loved my hair on my wedding day. Thank you Mandi!" and takes the time to listen to what her clients want. She has done some amazing balayage colour."